Kale seems everyone’s favourite vegetable at the moment. It has taken over the use of spinach and seems universally popular. 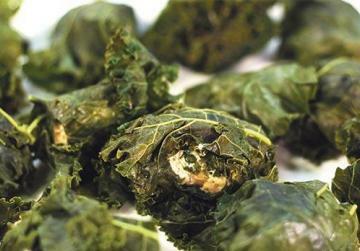 All types of kale are available locally with some varieties now being cultivated in Malta. In Malta, we find the is curly kale and it comes with a strong and slightly bitter taste. I have also seen the less common Red Russian Kale, with purple stems and reddish tips, in specialist greengrocers. My favourite kale remains the dinosaur kale, which is also sometimes referred to as Tuscan kale. It has dark green, textured, flat leaves and a sweeter and milder taste. Flat-leaf kale cooks very quickly and has a more tender consistency than curly kale. When it is steamed, the colour brightens and becomes vibrant and if you are in a hurry, simply soak the kale in boiling water for five minutes until it wilts. Kale is an acquired taste. I cook kale at least once or twice a week. Unlike lettuce, and other leaves that just provide bulk and texture, the addition of kale leaves to salads does improve the taste. You can buy the very popular, ready-made kale chips, but it is also very quick to make them fresh. The edges of the leaves cook faster and you need to make sure that you bake them at the right temperature to avoid over-crisp kale chips with soggy centres. To prepare kale, wash well, then remove the tough stem and cut the leaves with a pair of scissors. Peel and crush the garlic. Finely chop the onion. Place the onion and garlic in a large pot and sauté them in some olive oil. Remove the tough stem from the kale and cut the leaves up with a pair of scissors. Add the kale pieces to the pot and top up with boiling water until the leaves are fully immersed. Allow to boil for a minute, then lower the heat and simmer for half an hour. Add half the lemon juice and grated lemon zest. Stir and turn off heat. Allow to cool. Add the cannellini beans keeping some aside for garnish. Use a hand blender to puree the soup. Use the pulse setting and do not over-blend as the soup is more delicious with a coarse texture. Brush some olive oil on to the bread slices. Rub the bread with some garlic. Bake the bread slices at 200°C for around 10 minutes until just golden. Place a slice of bread in the bottom of each soup bowl. Pour the heated soup onto the bread. 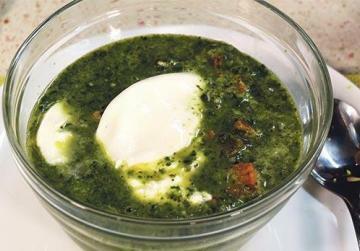 Place a fresh ġbejna in each soup bowl and garnish with more cannellini beans. This is a diabetic-friendly recipe. Wash, dry and trim the kale leaves. Remove the centre stem. Roughly tear the leaves into pieces or use scissors to cut them up. Mix the olive oil with the leaves until they are evenly covered. Toss the leaves in smoked paprika and salt. Spread the leaves on an oven tray covered with baking paper. 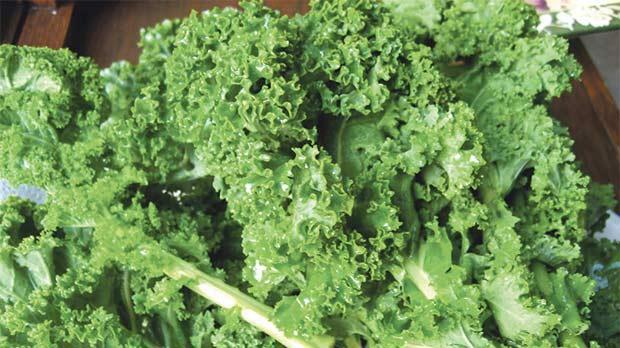 Bake for 10 minutes and keep an eye on them as the cooking time required depends on the variety of kale you are using. Turn the leaves over and bake them for another 5 to 10 minutes. Remove from the oven and allow to cool completely on the tray. Transfer to a serving dish. Mix the pork, lemon zest, onion, garlic, fresh and dried herbs, egg, oats together; add all the other ingredients to make a consistent mixture. Allow to rest for an hour in the fridge so that the oats absorb all the liquid. Roll into small balls and place them on a large dish covered with baking paper. Remove the centre stem from the kale and cut the leaves into long strips. Steam them for 2 minutes in a steamer until they are barely soft. Do not over-cook them. Immediately wrap the minced pork balls with the strips of kale to make small parcels and tuck the loose end of the kale leaf underneath. Prepare a steamer with water and add pieces of fresh turmeric, 2 whole cloves, a few leaves of fresh marjoram, a cinnamon stick and a garlic clove. Place the pork and kale parcels on the steamer tray and cook them in the infusion for 20 minutes. Serve the parcels with red rice and drizzle with olive oil before serving. Soak the rice in water for a couple of hours. Drain the water and rinse. Place the rice in a large saucepan and completely immerse in water. Add some salt and bring the water to a boil. Turn the heat down and cook for 30 minutes. Add more water if necessary and do not let it dry out. Drain the rice. Immediately add the lemon juice and zest. Mix and add the hazelnut oil. 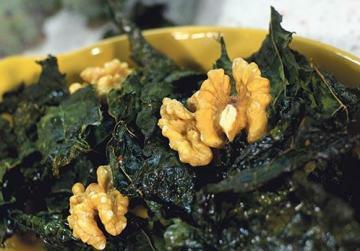 Season and serve with the kale and pork parcels and garnish with finely chopped hazelnuts. Lea’s Good Food Everyday is aired in English on Friday at 4.10pm and 9pm on Smash TV. You can follow her blogwww.goodfoodeveryday.wordpress.com and find more of her recipes on www.timesofmalta.com.